Ernest Becker noted that, ironically, the worst evils are created in the process of us trying to escape from evil. Humans commit terrible acts that arise from our fight against the evil of death. This chapter discusses how aspects of our curriculum and pedagogy are shaped by attempts to escape anxiety about our own mortality. 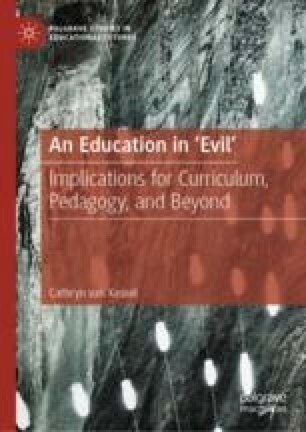 There is a particular focus on the profession of teaching as an immortality project (potentially helpful and harmful), as well as how we encounter resistance to alternative viewpoints arising from worldview threat. Baldwin, J. (1962, November 17). Letter from a region in my mind. The New Yorker. Retrieve from http://www.newyorker.com/magazine/1962/11/17/letter-from-a-region-in-my-mind. Liechty, D. (2015). Biography. Ernest Becker Foundation. Retrieved from http://ernestbecker.org/about-becker/biography/. Plutarch. (1927). De auditu (F. C. Babbitt, Trans). Cambridge, MA: Harvard University Press (Loeb Classical Library). Retrieved from http://penelope.uchicago.edu/Thayer/E/Roman/Texts/Plutarch/Moralia/De_auditu*.html.